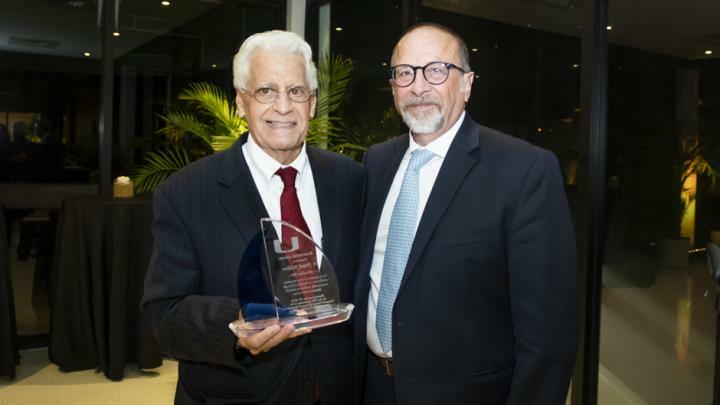 MIAMI–The University of Miami (UM) Rosenstiel School of Marine and Atmospheric Science selected Frank J. Millero as the 44th recipient of the Rosenstiel Award for his lifelong contributions to the field of marine chemistry. Millero is the first UM Rosenstiel School scientist to receive the award, which honors scientists who have made significant and growing impacts in their field. Millero, a world-renowned marine chemist and professor emeritus at the Rosenstiel School, joined the University of Miami in 1966. He is a leader in the application of physical chemistry to natural waters, and his work has defined the field for the last 40 years. As director of the Rosenstiel School's Marine Physical Chemistry Lab, he uses thermodynamic and kinetic principles to better understand the biogeochemical processes occurring in the marine environment. He was an early pioneer in the study of ocean acidification and the changes in ocean chemistry that result from global carbon dioxide emissions. His research group is involved in scientific studies to identify the global carbon dioxide cycle in the world's oceans in order to better understand how much atmospheric CO2 from the burning of fossil fuels is reaching the deep oceans. During the last four decades, Frank has made enormous contributions to the marine geochemistry and chemical oceanography fields. His work has resulted in numerous research cruises in the Indian, Pacific, Atlantic, and Southern oceans and the Arabian Sea, and in almost 600 published papers in peer-reviewed journals, 32 book chapters, five books, and numerous reports and abstracts. He is a fellow of the American Geophysical Union, the Geochemical Society, the European Association for Geochemistry, and the American Association for the Advancement of Science, and from 1986 to 2006 he served as associate dean of academic studies at the Rosenstiel School. The Rosenstiel Award is given annually to an individual on a rotating basis for achievements in five broad disciplinary areas: marine geosciences; atmospheric sciences; marine biology and ecology; ocean sciences and marine ecosystems and society. The Rosenstiel Award was created to recognize persons who make outstanding contributions either towards the development of ocean science in general, or through personal research and publications towards advancement of the understanding of the oceans, including their boundaries and interfaces, and the underlying phenomena.